The human body contains various elements which can be classified as abundant elements and trace elements. The normal function of the human body is reliant on a number of complex physiologic processes, and this function of the living body is through the maintenance of osmotic pressure and membrane potential. Growth and development of human body is influenced by his/her daily nutritional intake. The nutrients important for the healthy growth, development, and maintenance are micronutrients and macronutrients or trace elements. Trace elements are chemical elements required in minute amounts, usually as part of a vital element. Nineteen trace elements have been divided into three groups [Table 1]. Apart from being significant for a lot of other enzymes, copper (Cu) in its numerous forms is the third plentiful element in the body. Cu is concerned with the release process of energy inside the cell and contributes to the performance of many antioxidants. The regulation and formation of hormones such as melatonin are restricted by Cu, through a broad variety of neurotransmitters and other neuroactive compounds including the absorption of catecholamines. Furthermore, collagen production, configuration of red blood cells, and the oxidation of fats are reliant on the concentration of Cu. It is also necessary for the appropriate performance of Vitamin C and iron (Fe) absorption.,,,, Cu has varied roles in biological electron transport and oxygen transportation. Cu is an important component of other proteins associated with the processing of oxygen. Cu and Fe cooperate in the reduction of oxygen, in cytochrome c oxidase, which is necessary for aerobic respiration. Zinc (Zn) is an element with extensive application in health of humans. It is obligatory for a healthy immune system. It is also considered necessary for the cell division, hair, tissue, nails, skin and muscle growth, synthesis of protein, and collagen which are essential for wound healing.,,,, Zn is found in nearly 100 specific enzymes, and it serves in transcription factors as structural ions. It is “characteristically the second most plentiful transiting metal in organisms” after Fe, and it is the only metal which appears in all enzyme classes. In blood plasma, Zn bounds to and is transported by albumin and transferrin. As transferrin also transports Fe, too much of Fe reduces Zn absorption and vice versa. The amount of Zn in blood plasma stays comparatively constant in spite of Zn intake. Zn is used as a signaling molecule to communicate between cells of the salivary gland, prostate, immune system, and intestine with other cells. Fe is an important trace element found in almost all living organisms. The role of Fe in the maintenance, development, and defensive abilities of the oral mucosa has been well documented in the literature. Enzymes and proteins which contain Fe, often the heme prosthetic groups, take part in many biological oxidations and in transport. Hemoglobin, cytochrome, and catalase are the examples of proteins found in higher organisms. In the oral mucosa, Fe plays a part in the maturation of epithelium through the action of cytochrome oxidase and is also thought to have a role in the maintenance of the permeability barrier. The role of Fe in collagen synthesis is well established. Fe is a cofactor along with molecular oxygen alpha-ketoglutarate and ascorbic acid that is required for collagen synthesis by enzymes proline hydroxylase and peptidyl lysine. Currently, the primary focus has shifted to early detection of oral premalignant and malignant conditions rather than diagnosing it at advanced stages. If such lesions are timely detected and treated, it may not progress to worse conditions. There are various techniques such as comet assay test, nick test, and colposcopy that investigate the changes in oral tissues but are invasive or expensive. Trace elements have been extensively studied in recent years to assess whether they have any modifying effects in the etiology of precancer or cancer. Immunological and biochemical alterations in the serum of such patients can help not only in the early diagnosis, appropriate treatment but also as indicators of prognosis, as the disease progresses. Therefore, our review attempts to compare the biochemical investigations (serum levels of Cu, Fe, and Zn) in premalignant lesions or malignant conditions and to relate the importance of evaluated parameters. Hence, the aim of this paper was to study and compare the levels of Cu, Fe, and Zn in patients with premalignant lesions or malignant conditions. A schematic search was conducted to obtain appropriate articles for critical appraisal. Population, intervention, comparison, outcome was determined to appropriately decide the parameters to check\compare the levels of Cu, Fe, and Zn in patients with premalignant or malignant conditions for the search methodology, and relevant articles were searched from various databases such as PubMed and Google Scholar. Then, the searches from the various databases were combined, and duplicate articles were subsequently removed. By examining the bibliographies of retrieved articles, additional articles were identified and using the inclusion and exclusion, the titles of the retrieved articles were read independently by three authors. Articles were eliminated if two out of the three authors deemed it was inappropriate for inclusion. Finally, at the full-text stage, two investigators read and assessed each of the articles based on the criteria used in previous stages [Table 2]. The review included in vivo human studies published in English language. Studies with premalignant and malignant conditions and trace elements including Cu as an essential element, and Fe and Zn as other elements were considered. No limit was placed on a number of patients and studies involving blood investigations were included in this review. The exclusion criteria were in vitro nonhuman non-English studies. Case series, case reports, and retrospective studies were also excluded and studies not having any of the above-mentioned trace elements were also excluded from the study [Chart 1]. Areca nut has high Cu content (302 nmol/g), the substantial amount of which is released in saliva, 15–30 min after chewing areca nut. Cu is the nutrient essential to carry out enzymatic functions important for human metabolism, including cytochrome-c oxidase, superoxide dismutase (SOD), metallothionein, and lysyl oxidase. In vitro, raised Cu concentrations show increase proliferation of fibroblasts. High Cu and ceruloplasmin levels were observed in patients with premalignant and malignant and oral lesions. Some studies have shown that high Cu is responsible for severity of OSMF. The damage caused by Cu ions is due to superoxide radicals, these complexes react with hydrogen peroxide to form hydroxyl radicals that cause the destruction of RNA, DNA, and protein ultimately resulting in the malignancy. The reason behind increase serum Cu might be the release of Cu containing the ceruloplasmin due to the inflammatory response of liver or reduced degeneration of serum ceruloplasmin. Cytological study confirmed the important role of Cu in the pathogenesis of OSMF showing intense staining in smears of OSMF as compared to smears from nonchewers. Thus, it can prove an efficient marker of early diagnosis of malignant transformation [Figure 1]. Zn is an important part of biomembranes that manage membrane stability and lipid peroxidation-related injury. The role of Zn in carcinogenesis can be suggested by its role in DNA and RNA polymerase, inhibitory effect on phosphodiesterase, and activation of membrane-bound adenylyl cyclase. Deficiency of Zn also contributes to cancer initiation by the activation of nuclear factor-kappa B expression and consequent induction of tumorigenic signaling. The role of Zn as a trace element in OSMF has been evaluated in many studies. Reduced levels of Zn were found in most studies and were attributed to the decreased immunity status of individuals.,, Zn is a constituent of SOD, an enzyme that removes free radicals, Zn has the reverse effect and protects against carcinogenesis. Second, Zn decreases the activity of Cu-containing lysyl oxidase enzyme, and thus causes the inhibition of cross-linkage of collagen peptides. It also plays a noteworthy role in promoting collagen degradation through collagenase and matrix metalloproteinase. Zn thus bears an inverse relationship with Cu and interferes with the mucosal absorption of Cu. OSMF can be a sign of chronic Fe deficiency and a counterpart of Plummer–Vinson syndrome. The reason of Fe deficiency in OSMF patients can be multifactorial. It may be due to the utilization in collagen formation by the process of hydroxylation of proline and lysine, altered epithelial cell turnover rate, or depletion of nutrients due to pronounced difficulty in mastication. Sarcomas and skin cancers have been reported, where intramuscular injections with Fe dextran were used. Different malignant neoplasms of various organs are seen in idiopathic hemochromatosis, but liver cancer is a common complication. The mechanisms of carcinogenesis are thought to be that Fe bound to liver generates hydroxyl radicals through the Fenton reaction that further damages the DNA. Controversial to above-mentioned studies, Srilekha concluded that Cu and Zn deficiencies develop in OSMF, serum Cu and Zn levels are sensitive, but not specific, whereas serum Cu Zn ratio is the most reliable indicator in assessing progression of malignancy. Some recent studies,,, also estimated and compared the levels of serum Cu and Fe among participants with OSMF of different clinical stages and healthy controls and found that Cu level increased as clinical stage of OSMF increased, and Fe level decreased in OSMF group in comparison to healthy controls. It was also evident that the serum values of Cu and Zn in patients with oral cancer were high and Fe levels were low when compared with the control group [Table 3], [Table 4], [Table 5], [Table 6]. Trace elements such as Cu, Zn, and Fe are required in minimal quantities for normal functioning of the body. Trace elements have been extensively studied in recent years to assess if they have any modulating effects in the predisposition of premalignant and malignant conditions. Trace elements are also known to act as anticancer agents through control of a number of biological mechanisms. Thus, a comprehensive understanding of these trace elements can be used as a reliable biomarker for development and progression of oral cancer. Kulkarni N, Kalele K, Kulkarni M, Kathariya R. Trace elements in oral health and disease: An updated review. J Dent Res Rev 2014;1:100-4. 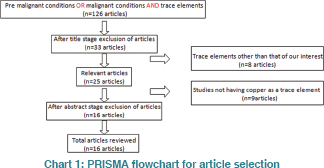 Pathak MU, Shetty V, Kalra D. Trace elements and oral health: A systematic review. J Adv Oral Res 2015;7:12-20. Bowen HJ. Trace Elements in Biochemistry. 2nd ed. New York: Academic Press; 1976.
WHO. Trace-Elements in Human Nutrition. Report of a WHO Expert Committee, WHO Technical Report Series, No. 532. Geneva, Switzerland: World Health Organization; 1973. World Health Organization. Trace Elements in Human Nutrition and Health. World Health Organization; 1996. Nayak AG, Chatra L, Shenai PK. Assistant of copper, zinc levels in mucosal tissue and serum of OSMF patients. J Dent 2010;1:75-8. Vyas RK, Gupta AP, Gupta A, Aeron AK. Serum copper, zinc, magnesium and calcium levels in various human diseases. Indian J Med Res 1982;76:301-4. Trace Elements. Wikipedia, the Free Encyclopedia. Available from: http://en.wikipedia.org/wiki/Trace_element. [Last accessed on 2014 May 03]. Nguta JM. Essential Trace Elements: Trace Elements in Human and Animal Health. Germany: LAP, Lambert Academic Publishing; 2010. Kamath VV, Satelur K, Komali Y. Biochemical markers in oral submucous fibrosis: A review and update. Dent Res J (Isfahan) 2013;10:576-84. Broadley MR, White PJ, Hammond JP, Zelko I, Lux A. Zinc in plants. New Phytol 2007;173:677-702. Rink L, Gabriel P. Zinc and the immune system. Proc Nutr Soc 2000;59:541-52. Rennie JS, MacDonald DG, Dagg JH. Iron and the oral epithelium: A review. J R Soc Med 1984;77:602-7. Bouquot JE, Whitaker SB. Oral leukoplakia – Rationale for diagnosis and prognosis of its clinical subtypes or “phases”. Quintessence Int 1994;25:133-40. Gupta PC. Leukoplakia and incidence of oral cancer. J Oral Pathol Med 1989;18:17. Babu S, Bhat RV, Kumar PU, Sesikaran B, Rao KV, Aruna P, et al. A comparative clinico-pathological study of oral submucous fibrosis in habitual chewers of pan masala and betelquid. J Toxicol Clin Toxicol 1996;34:317-22. Rathod S, Khandekar S, Raj A. Prevalence of oral submucous fibrosis and risk factors in rural population. Dent Dialogue 2015;41:19-21. Rathod S, Wanikar I, Raj A, Maske S, Harkare V. Association between kharra chewing and periodontal health status in oral submucous fibrosis patients of central India, Nagpur. J Indian Soc Periodontol 2018;22:345-7. Arakeri G, Hunasgi S, Colbert S, Merkx MA, Brennan PA. Role of drinking water copper in pathogenesis of oral submucous fibrosis: A prospective case control study. Br J Oral Maxillofac Surg 2014;52:507-12. Murti PR, Bhonsle RB, Pindborg JJ, Daftary DK, Gupta PC, Mehta FS, et al. Malignant transformation rate in oral submucous fibrosis over a 17-year period. Community Dent Oral Epidemiol 1985;13:340-1. Rathod S, Wanikar I, Kolte AP, Maske S, Joshi S, Harkare V. Use of colposcopy in diagnosing early dysplastic changes in oral premalignant condition. J Int Clin Dent Res Organ 2017;9:62-6. Khanna SS, Karjodkar FR. Circulating immune complexes and trace elements (Copper, iron and selenium) as markers in oral precancer and cancer: A randomised, controlled clinical trial. Head Face Med 2006;2:33. Arakeri P, Arakeri G. Dietary copper: A novel predisposing factor for oral sub mucous fibrosis? Med Hypothesis 2013;80:241-3. 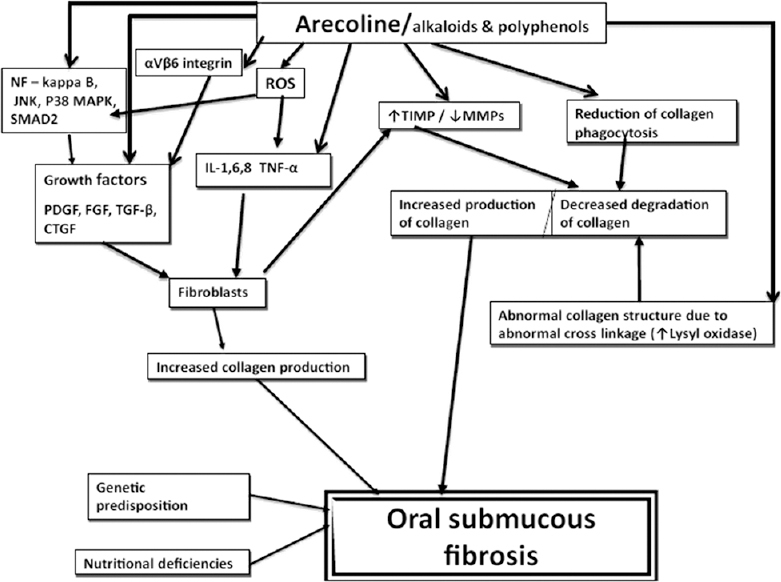 Sabharwal R, Gupta S, Kapoor K, Puri A, Rajpal K. Oral submucous fibrosis – A review. J Adv Med Dent Sci 2013;1:29-37. Bansal S, Leekha S, Puri D. Biochemical changes in OSMF. J Adv Med Dent Sci 2013;1:101-5. Hosthor SS, Mahesh P, Priya SA, Sharada P, Jyotsna M, Chitra S, et al. Quantitative analysis of serum levels of trace elements in patients with oral submucous fibrosis and oral squamous cell carcinoma: A randomized cross-sectional study. J Oral Maxillofac Pathol 2014;18:46-51. Paul RR, Chatterjee J, Das AK, Dutta SK, Roy D. Zinc and iron as bioindicators of precancerous nature of oral submucous fibrosis. Biol Trace Elem Res 1996;54:213-30. Khademi H, Shaikhiany J. Comparison of serum zinc levels in recurrent apthous stomatitis patients and normal individuals. Dent Res J 2006;2:1-5. Ray JG, Ghosh R, Mallick D, Swain N, Gandhi P, Ram SS, et al. Correlation of trace elemental profiles in blood samples of Indian patients with leukoplakia and oral submucous fibrosis. Biol Trace Elem Res 2011;144:295-305. Fukuda H, Ebara M, Yamada H, Arimoto M, Okabe S. Trace elements and cancer. JMAJ 2004;47:391-5. 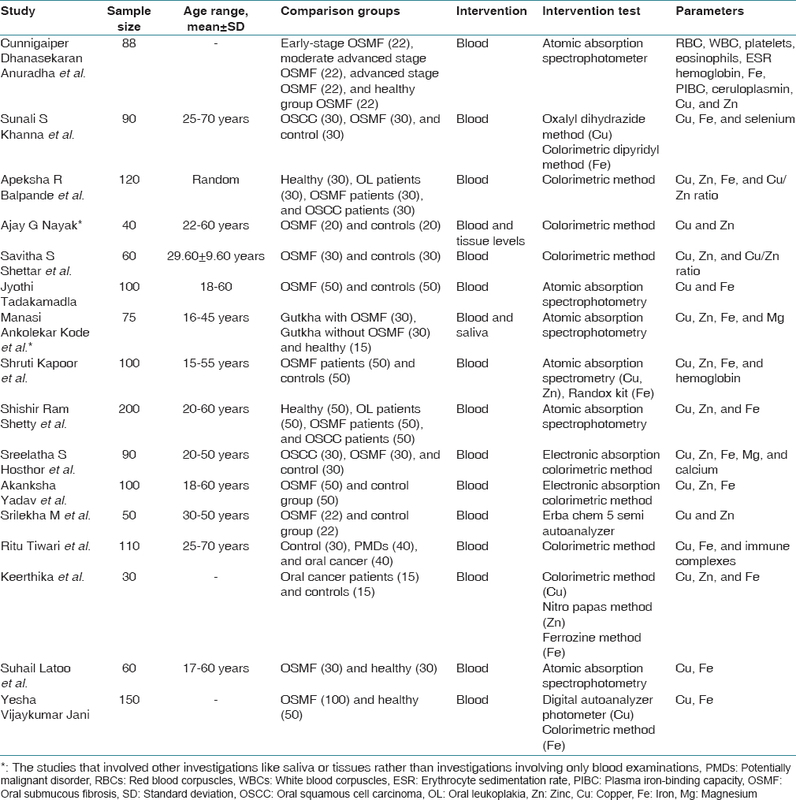 Bhattacharya PT, Misra SR, Hussain M. Nutritional aspects of essential trace elements in oral health and disease: An extensive review. Scientifica 2016;2016:5464373. Mohammad H, Hadi NI, Younus S, Ahmed F, Younus N. Potentially significant biomarkers in oral submucous fibrosis. Pak J Med Dent 2015;4:51-6. Shetty S, Babu S, Kumari S, Shetty P, Hegde S, Catelino R. Status of salivary iron in oral cancer and oral potentially malignant disorders. J Craniomaxilofac Dis 2014;3:17-20. Anuradha CD, Sityamala Devi CS. Studies on the hematological profile and trace elements in oral submucous fibrosis. J Clin Biochem Nutr 1995;19:9-17. Tiwari R, David CM, Mahesh DR, Sambargi U, Rashmi KJ, Benakanal P, et al. Assessment of serum copper, iron and immune complexes in potentially malignant disorders and oral cancer. Braz Oral Res 2016;30:e101. Shetty SR, Babu S, Kumari S, Shetty P, Hegde S, Karikal A. Role of serum trace elements in oral precancer and oral cancer – A biochemical study. J Cancer Res Treat 2013;1:1-3. Shettar SS, Mubeen. Estimation of serum copper and zinc levels in patients with oral submucous fibrosis. JIAOMR 2010;22:193-6. Balpande AR, Sathawane RS. Estimation and comparative evaluation of serum iron, copper, zinc and copper/zinc ratio in oral leukoplakia, submucous fibrosis and squamous cell carcinoma. J Indian Acad Oral Med Radiol 2010;22:73-6. Kode MA, Karjodkar FR. Estimation of the serum and the salivary trace elements in OSMF patients. J Clin Diagn Res 2013;7:1215-8. Kapoor S, Kaur M, Dangi CB, Singh M, Wig P. Quantitative Analysis of trace elements and haemoglobin as biological markers in patients with oral submucous fibrosis in central India. J Public Health Photon 2013;115:147-58. Yadav A, Kumar L, Misra N, Deepak U, Shiv Kumar GC. Estimation of serum zinc, copper, and iron in the patients of oral submucous fibrosis. Natl J Maxillofac Surg 2015;6:190-3. Srilekha M. Copper and zinc level in oral submucosal fibrosis (OSMF) patients. J Pharm Sci Res 2015;7:573-4. Tadakamadla J, Kumar S, GP M. Evaluation of serum copper and iron levels among oral submucous fibrosis patients. Med Oral Patol Oral Cir Bucal 2011;16:e870-3. Keerthika, Priya V, Gayathri R. Estimation of serum copper, zinc and iron in patients with oral cancer. Int J Pharm Sci Rev Res 2016;39:251-4. Latoo S, Nazir H. Estimation of levels of copper and iron in different stages of OSMF patients. Ann Int Med Dent Res 2017;3:6-8. Jani YV, Chaudhary AR, Dudhia BB, Bhatia PV, Soni NC, Patel PS, et al. Evaluation of role of trace elements in oral submucous fibrosis patients: A study on Gujarati population. J Oral Maxillofac Pathol 2017;21:455.